I have this new thing--I have a lot of new things--which is that I play the piano, and often sing, every day. I tried working on classical pieces I already knew, like Bach preludes or Mendelssohn Songs Without Words; I tried learning new classical pieces, like Debussy's Arabesque No. 1; but I just wasn't getting anywhere. It seems this isn't a self-improvement project so much as a meditative exercise, or even just plain play. So now I wander into the room with the piano after my yoga class and my Pavlovian post-yoga cold brew (or earlier if the school bus or laziness causes me to miss yoga class) and I play whatever strikes my fancy, based on what I dreamed about, or a thing I heard that reminded me of a thing that reminded me of another thing. 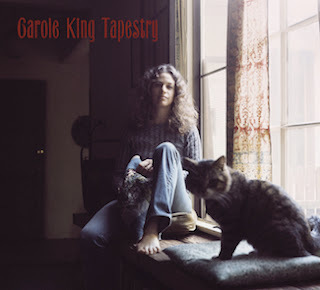 Today, as every so often since I first bought it seven years ago, I was playing Carole King's "Tapestry" from the album of the same name. I remember my father throwing "Tapestry" idly on the turntable about ten years after the album came out, commenting that it was as good as a Hits of the 60s compilation because of "Will You Still Love Me Tomorrow?" "You've Got A Friend," and "Natural Woman." I liked those, but I also loved "So Far Away," "Home Again" (which I used as an audition piece in front of a bewildered production team for a summer "Pirates of Penzance"), and especially the title song. I listened to that album so many times, for so many hours, on the rust-colored corduroy couch in my parents' dimly-lit living room. Sometimes I softly crooned to myself, sometimes I pored over the album cover, most times I just listened, and then from time to time I jumped up and went into the yellow shag-carpeted study to turn the record over and drop the needle again. I miss self-returning arms; our current turntable doesn't have one. Sometimes I worry that my kids didn't get this kind of utterly wasted, lazy yet intense time with anything. Where was the rest of my family? (I do dimly recall a voice telling me to turn a light on) Wasn't there something I should have been doing? (I know, know, going outside and getting some fresh air). Anyway, when I looked at that album cover, I saw something I recognized, and more that I wanted. It still looks very familiar, apart from the fact that my hair will never have body or wave: the bare feet, the jeans, the any old sweater, the somewhat boho decor, the tabby cat, check check check check check. Okay, if I were working on a tapestry it would be in a bag under a table in the living room for months, not in my hands, BUT I'm not posing for an album cover. I had a vague fantasy, a very vague fantasy, as I listened to "Tapestry" that I would one day have a cabaret act in which I sang the album in its entirety, and I would wear (memory reels, even confined to the interior realm) a dress with an actual tapestry panel on its blousey front. What a very early-80s dress that would have been. My act has not come to pass. I am, though, weaving my tapestry, singing my song, with writing; and I'm getting glimpses of those things that intrigued me before seventh grade obliterated everyone's real self for a while. One last note, about notes: I know every one on this album, played by every instrument. Pop sheet music is often heartbreaking, partly because pop isn't always piano-based, but also because transcribers don't seem to care about helping you recreate album sound. The Hal Leonard "Tapestry" book sounds just like the album. It is a joy, and if you use this affiliate link to buy it, you won't be sorry. Pick up the album, too.